For those of you who don’t have the time to make your own The Tiger Nut Company now have three versions of nutritious and delicious ready made horchata or tiger nut milk. This is the sugar free version, made with agave. This is less sweet than the traditional version and only 52 calories per 100 mls. 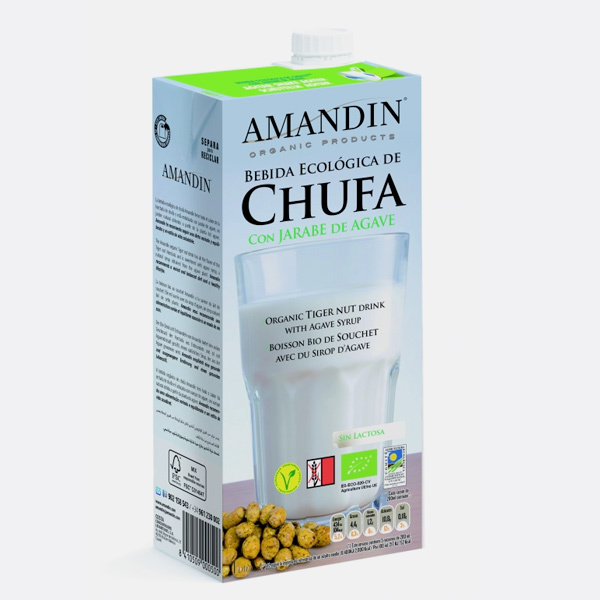 It is made with organic tiger nuts,and is Gluten Free, Lactose and Dairy Free. water, tiger nuts, agave syrup, corn maltodextrin, cassava starch, sunflower lecithin. Made the milk using the Valencian Tiger Nuts - very impressed with the results. Thanks due to the Hairy Bikers I had no idea about these little nuggets of goodness. I used the unpeeled organic tigernuts to make milk. I used the unpeeled organic tigernuts to make milk. It was an easy process with a blender and nut milk bag and it tasted great, just like the real thing! They are also yummy to just munch on as a snack and the cocoa dusted tigernuts are a real treat. Tiger nuts, cacao, vanilla and cinnamon, what a winning combination! I like the chewiness of the unpeeled tiger nuts but my favourite are the cocoa dusted ones. I would recommend trying them!. I bought them for my Dad for his birthday and we were all delighted with them. Wonderful customer service and delicious Tiger Nuts. Wonderful customer service and delicious Tiger Nuts. This was my first purchase on Yumbles and I am impressed with the fast checkout.